When I first worked with copper I loved its shiny face. It looks so rich, and the big pieces clank together like armour. The first kilo of wire I bought was 0.8mm width – a nice do-everything wire. I bought non-tarnish, because that meant the shine would stay on. The non-tarnish wire is treated with a clear enamel, so if the piece is looked after, it won’t tarnish – ever. I’ve soon come to learn, though, that one of copper’s qualities is its tarnish. When it begins to burnish red-gold you might think your eyes deceived you until you compare it with something newer. This gradual process is beneficial for the look of the piece, as long as you polish it. There are some gaps your polishing cloth will never get into, and that means that your item seems to become more and more 3-d as time goes on. 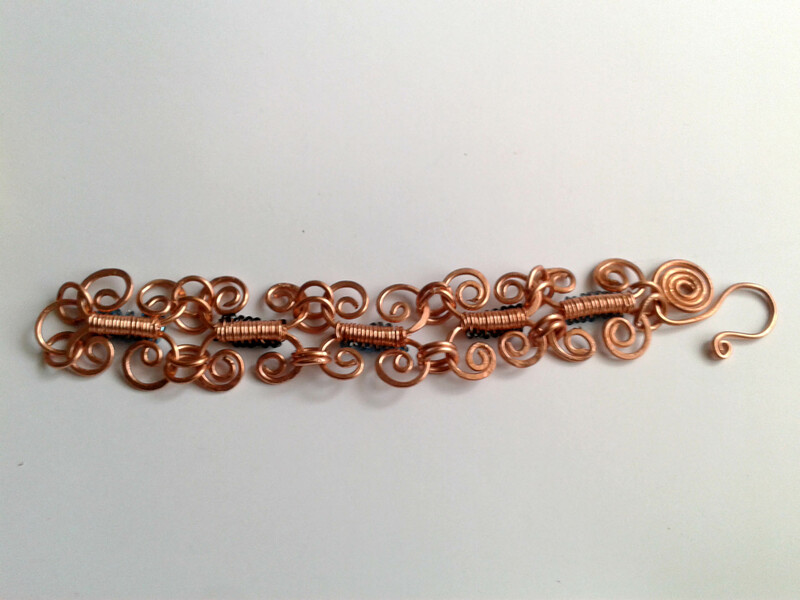 One way in which the tarnish can be made a real feature is by using a combination of non-tarnish and bare wire. This butterfly bracelet will be a great example of that when it has become tarnished over time. 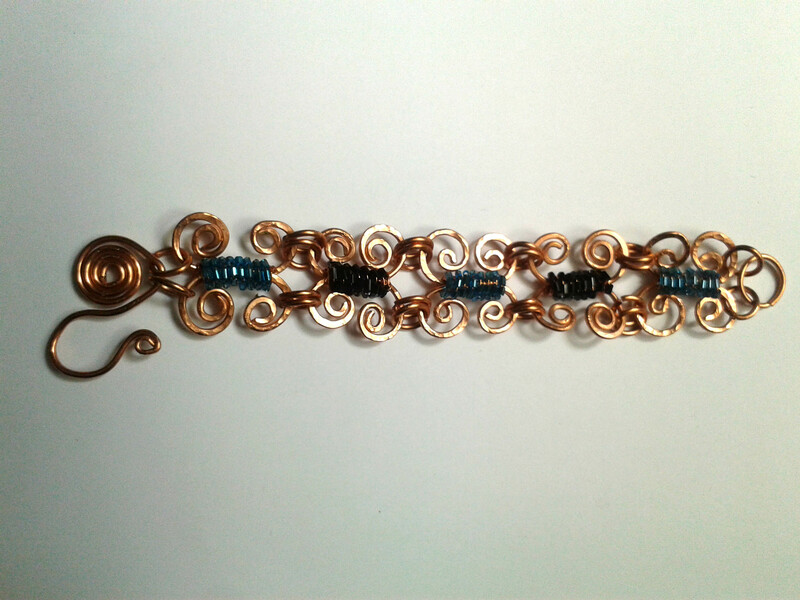 The coils to which the beads are fixed are made of the non-tarnish wire, while the rest of the piece has been created so that it will change colour. Making a feature of something like this is part of building the unique qualities of a piece of copper jewellery. Sometimes non-tarnish copper wire is better for certain items, and I really like the effects when I use it for some earrings. The bright shiny copper stands out against the colours of the beads, and creates a tiny bit of drama for your ears. Polishing, from what I can tell, is just one of those jobs that is a bit boring, but you gotta do it. Except, if you’re a messy person, and you’re the kind of person who finds they’re usually covered in whatever they’re doing, it’s a fairly dirty job. I always end up looking like a chimney sweep on a tough day. One of my biggest problems with the whole jewellery-making venture is that nothing ever seems polished enough for my liking. I’m experimenting with different techniques at the moment, but mostly I think it’ll involve paper towels. Obviously non-tarnish wire has its advantages in the polishing arena, especially if you don’t think you’re very good at it, and when it comes to wearing it, at least you don’t have to be the kind of person who has copper polish under the sink. Expensive or cheap look for your jewellery? I don’t believe copper looks cheaper if it’s a bright brassy yellow; I especially like it bright on my rings, and in that state it doesn’t look out of place near my gold ring. Now I’ve had a proper go at using liver of sulphur (very few retailers stock it), I can also appreciate the power of a well-polished, tarnished piece of jewellery. Even though the shiny stuff strikes the eye more, the polished piece has more depth. Whatever you choose will be down to your own personal tastes, which is why I aim to produce pieces that are very different from each other. Thanks for sharing my work! Pop your email address in the box here and be the first to see brand new jewellery and designs!